J. Perrotin discovered asteroid #180 Garumna. Karl Benz patented the first successful gasoline-driven automobile. A. Charlois discovered asteroids #382 Dodona and #383 Janina. US inventor Lee de Forest applied for a patent on the grid configuration of his "Audion" tube, a 3-element amplification valve which proved to be a pioneering development in radio and broadcasting. US Patent 879,532 was granted 18 February 1908. K. Reinmuth discovered asteroid #1014 Semphyra. K Reinmuth discovered asteroid #3425 Hurukawa. Clyde Tombaugh finished the 6-night observing run that led to the discovery of Pluto. K Reinmuth discovered asteroids #1216 Askania, #1218 Aster, #1968 Mehltretter, #2485 and #2942. K. Reinmuth discovered asteroid #1259 Ogyalla and #1260 Walhalla. E. Delporte discovered asteroids #1672 Gezelle and #1711 Sandrine. C. Jackson discovered asteroid #1816 Liberia. NASA launched the SA-5 Saturn I rocket into orbit as a launch vehicle development test. 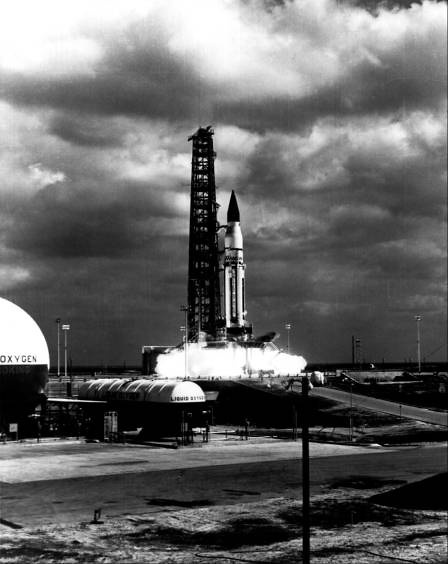 The SA-5 Saturn I flight was used for a launch vehicle development test. The launch on 29 January 1964 was the fifth flight of a Saturn rocket and the first of the Block II Saturn. It was also the first live flight of the LOX/LH2 fueled second stage (S-IV). More than 11,000 measurements were taken. Goethe Link Observatory discovered asteroid #2196 Ellicott. The Sijthoff planetarium in the Hague, which used a Zeiss projector "to explain the operation of the solar system and the universe," was severely damaged by fire, prior to its demolition in 1984. The Height 611 UFO Incident occurred, an alleged UFO crash in Dalnegorsk, Primorsky Krai, Soviet Union. USSR Phobos 2 spacecraft went into orbit around Mars. USSR launched Soyuz-TM 27 to the Mir space station with cosmonauts Talgat Musabayev, Nikolai Budarin and Leopold Eyharts aboard. NASA's STS 89 (Endeavor 12, 89th Shuttle mission) undocked from the Russian Mir space station during the eighth Shuttle-Mir docking mission.